Twenty years ago, I backpacked and hiked along the wild beaches and coastal rainforests of the Osa peninsula and became acquainted with some of the fantastic wildlife that the region is well-known for. Near the Sirena station at Corcovado National Park, I became intimate with the loud squawks of Scarlet Macaws sailing overhead, the crash of surprised tapirs bolting through the forest, and the pre-dawn chorus of Howler monkeys. One of the sensory aspects I appreciate most about exploring this region is the rich array of sounds that greets the rainforest naturalist. The forests of the Osa are alive with every kind of exotic screech, hoot, cry, whistle and howl. However, there was one voice that alluded me during that first trip many years ago; that of a little poison dart frog unique to the region, Phyllobates vittatus, the Golfo Dulce poison dart frog. Though the call of Phyllobates vittatus was certainly in the mix of the rainforest cacophony that greeted me back then, I just didn’t know how to identify it and discover its secrets within the complex mystery of the jungle matrix. 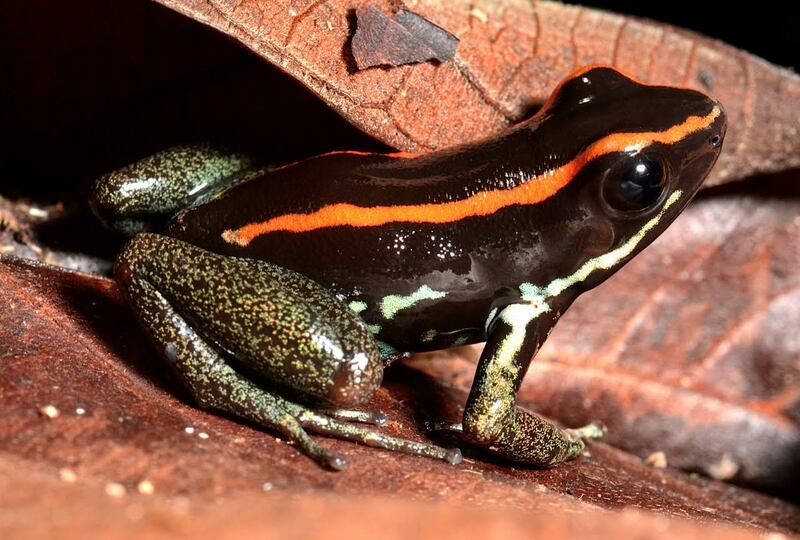 On a recent trip to the Cabo Matapalo region, I was focused on encountering this beautiful red/black/green jewel of a frog and to document some of its natural history and beauty in photos. From my research, I knew that Phyllobates vittatus is endemic to southwestern Costa Rica and found from Domincal in the north to (likely) the Boruca peninsula in the south. Due to its limited distribution, P. vittatus is listed by the IUCN as an endangered species. P. vittatus is known to inhabit primary forest microhabitats near streams; it’s diurnal and dwells in the leaf litter of the forest understory. Phyllobates vittatus is one of the true poison dart frogs with another sister species found in the Caribbean slope of Costa Rica and Panama (Phyllobates lugubris) and three other known relative species in the Chocó rainforest of Colombia (Phyllobates aurotaenia, Phyllobates bicolor and Phyllobates terribilis). The evolutionary links to the Chocó appear to be a common theme in Osa natural history. During our first day in the Matapalo forest, my wife and I went for a late afternoon walk along a perennial creek with a rocky stream bed covered in fallen leaves. It seemed like the ideal habitat for Phyllobates vitiates, and it was! My wife found our first Phyllobates vittatus hanging out in a sheltered spot below a fallen log. Interestingly, I found this very frog in the same spot during my informal surveys over the course of the next week. P. vittatus appears to be fairly territorial in its habits. As the night was approaching quickly, my wife and I decided to resume our Phyllobates search for the following morning. A few hours after the next dawn, we were rewarded with the discovery of several vocalizing males singing from the creek banks. Luckily, I was able to photograph the frogs in their microhabitat and witnessed several courting male/female pairs. 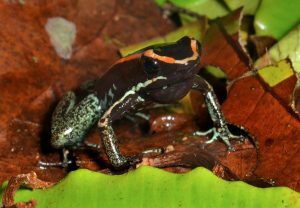 The male P. vittatus serenades the female as she looks on. If all goes well, and both parties are mutually interested, the pair will retire to a sheltered spot in the fallen leaves where they will lay 7 to 21 eggs. The eggs will hatch in a couple of weeks; during that time period the male will periodically return to the developing embryos and moisten them with water shed from a specialized patch of vascularized tissue on his posterior. When the tadpoles hatch, they will then be visited by their father, climb onto his back and he will hop off into the forest to find a small pool of water for them to complete their development into little frogs some forty-five days later. As our days of birding, botanizing and frogging unfolded during our relaxing week in Cabo Matapalo, the song of Phyllobates vittatus was a constant companion as it greeted us cheerfully from nearly every creek, spring and stream bed along the forest trails we visited. I came to look forward to hearing it as much as I enjoyed the raucous call of the macaws, the screech of the parakeets, the complaints of monkeys and the crashing of waves along the wild beaches. I realized that Phyllobates vittatus presence in these forests is a small but critical voice in the rich tapestry of biodiversity that gives southwestern Costa Rica its unique and charming character. 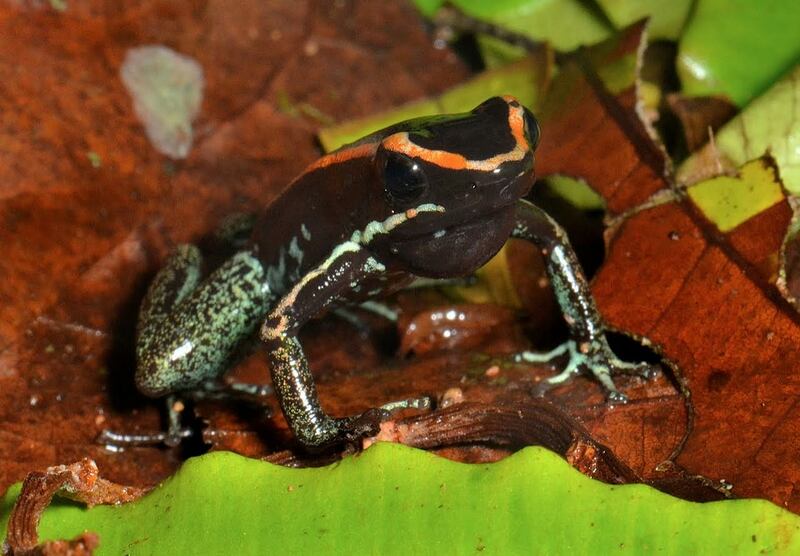 This entry was posted in Science and Research, Volunteers and Visitors and tagged Bosque del Rio Tigre, Conservation, Costa Rica, dart frogs, discovery, endemic, environment, frog, frogs, golfo dulce, osa, phyllobates vittatus, Rainforest, research, trip, vacation. Bookmark the permalink.